Each one of us may endure times in our lives when we feel that we simply cannot go on. The troubles we face seem overwhelming. During such difficult times, one can easily question life’s purpose. Author Molinda Sunde Parker expresses how discouraging such moments can be. The wisdom gained, however enriches one’s life in immeasurable ways. This novel, addresses the issue of personal loss, as well as the joy and love offered by family, friends, and even a newborn kitten. This book tells an unforgettable story that may be fictional, yet inspired by actual events and real people. The narrator, a young woman facing the challenges of adult life, learns that we can all make a difference in this world. The story's heroine demonstrates her dedication to fulfilling her dream against daunting odds. Blessed with the undying support of loved ones, she finds the courage within. 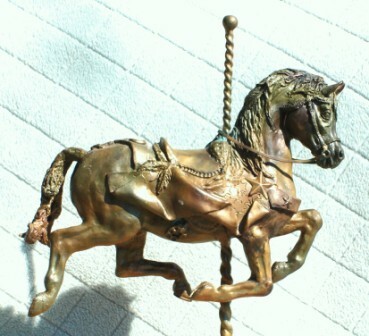 Please visit the Beau Cheval Carousel & the associated bronze sculptures page. The Star Pacer bronze was inspired by Rajah, Mo's Arabian horse about whom this book was written.